The pianist Heidrun Bergander decided to fly me over to Catalunya to prepare her Tuinman fortepiano for a concert in Conca de Barbera. 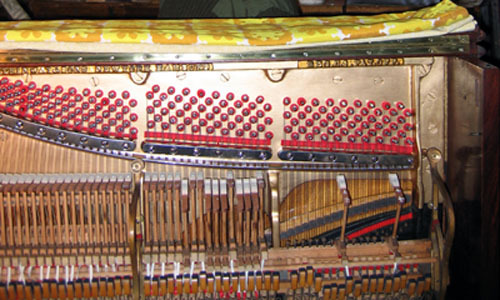 Early instruments have much lighter stringing than modern pianos – and so are much less stable in their tuning. However, this lovely copy of a Walter 1805 fortepiano took the 1 hour journey and adjusting to the atmosphere within the walls of this medeival castle and re-adjusting to the heat of the lights and audience….and only needed tuning twice more before it gave a perfect performance! Once re-bushed, all keys (naturals & sharps) may need some fine spacing. This is best done prior to key levelling. The sharps are classically spaced very slightly towards the centre of the keyboard, bearing in mind that the movement of the pianist’s hand puts a slight outward pressure on each key. Also, the groupings of the sharps (c sharp, d sharp / f,g,a sharps) should have equal spacing between each key, so that the pianist’s fingers will reliably fit. 1 If keys are not properly upright (and their respective capstans can also safely be altered), some correction of the balance pin is appropriate. 2 If the spacings need adjusting at the front guide (bat) pin, first remove the baize, then bend the bat pin as close to its fixing as possible, so as not to bring any curvature into the functional length of the pin. 3 If moving the key in either of the above ways makes the distal ends rub (and you’re sure the correction is really necessary), then fine planing of any excess key wood is the final step. Sometimes, this brings the cut close to the felt staple, so this too needs cutting/filing (otherwise you’ll get to hear that sickening sound of a beautifully sharp blade striking metal), and the felt perhaps needs rounding off.